Let’s talk kitchen trends and how people are adding value and one of the most important rooms to revamp in the house. Whether the plan is to update before selling a home or to overhaul the space when a homeowner decides to stay put, the kitchen’s always a great place to invest a renovation budget. 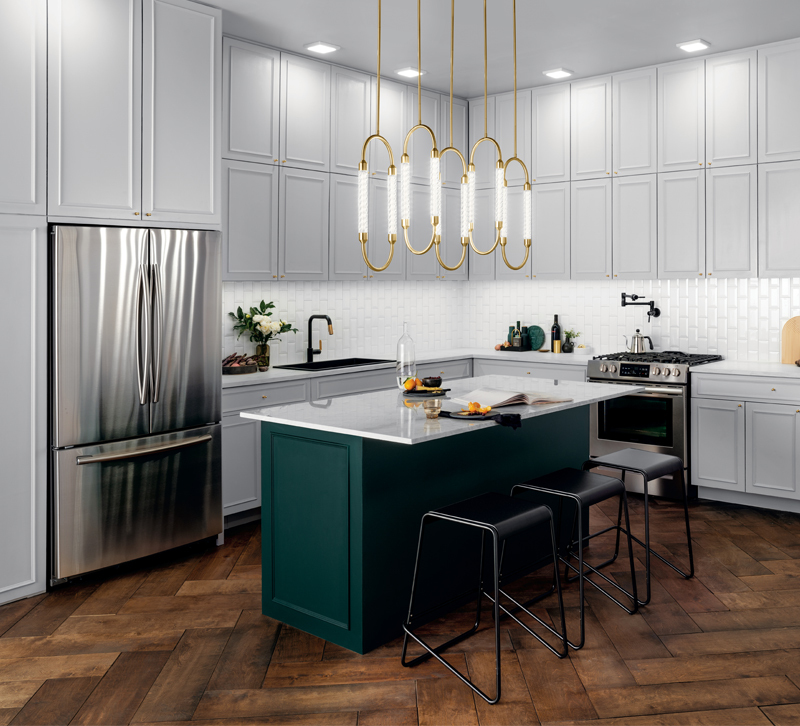 As Furniture, Lighting & Decor reported on research from its sister publication, Professional Builder, back in October 2018, it’s clear that over 40 percent (44.1 percent to be exact) of people who invested in their kitchens chose to upsize them. While a staggering only 3.7 percent said they downsize their kitchens, we know there is an obvious trend towards spending more time and having a more spacious to entertain. There’s no denying it: Kitchens are gradually getting bigger and homeowners want to spend more time in them. I see in almost every new construction home that we design for our clients in Philadelphia, that the number of counter stools has increased over the last few years. Because the open concept floor plan is not going anywhere, it seems that the kitchen island is becoming an extension of the dining room. Many times with open concept plans, the island is adjacent to the dining room in a home, and counter height stools become part of a cohesive design aesthetic. Many times designers specify the nearby stools to match chairs in the dining room. Furniture vendors in recent markets have been releasing collections of dining chairs and counter stools for this reason. Having guests and family gatherings in the kitchen is a bit more casual than the formal dining rooms in years past and allows for ease in buffet-style entertaining. The modern family loves spending time in the kitchen to do homework, eat breakfast before work or do arts and crafts with friends at the island. Because the trend has been in recent years to do away with the bar-height surface at kitchen counters, which was popular in the early 2000s, homeowners benefit in saving on expensive labor costs to cut and fit stone and keeping more seamless graining patterns with counter height islands. The frequency of designers’ specifying barstools is lower compared to that of counter-height stools because of this kitchen island design trend. Now that kitchens are being outfitted to accommodate four and five counter stools in modern homes, the seating’s design is more important than ever and is now available with more of a variety new finishes, styles and looks. Take a look at the three-legged counter stool. These stools have gorgeous curved lines that create a look that is more ethereal that integrates an Art Deco-inspired look. Leathers and cowhides are becoming more prominent in kitchen island seating in recent years. Brushed Brass and shiny gold finishes are frequently used in these on-trend counter stools’ metal frames. The only downside to these stylish chairs and stools with three legs is they can tip over if they’re not pulled out with two hands. I recommend them for clients who don’t have children under the age of 7 years old. Another important consideration when specifying stools for the kitchen is weight. It’s important to know our client’s lifestyle, and the physical weight of counter stools is something to be aware of when pulling options for clients. Take a closer look at spec sheets from vendors on these items and be sure not to use them for older clients for ease of use. A trend that I see in our marketplace both in shelter magazines as well as when visiting High Point and Las Vegas markets is that the scale of pendants in the kitchen has grown larger in recent years. So-called “small chandeliers” (18-24 inches wide) have replaced the traditional-sized (4-6 inches wide) pendants, and when multiple are hung, they make for a dramatic look over a kitchen island or the dining room table. This look is very popular and has a glamorous appeal, but it could date over time. Be sure to use these in homes for clients who are open to updating again in the future. Another way to play it safe while staying on trend is to use pendants that are medium in size (about 12 to 15 inches wide) to use lighting in a transitional way. Finally, let’s talk about cabinet finish. We all know that white kitchen cabinets have been at the forefront of kitchen design, and Professional Builder’s study found that 37.2 percent of cabinets are white. Painted finishes in blues and greens have made a statement recently in traditional kitchen design to contrast the most popular wave of white, Shaker-style kitchens. Adding color is a great way to add a punch of personality while keeping a traditional style kitchen with personality. From the modern end of the kitchen design spectrum, we’re seeing slab front style kitchens featuring wood grain cabinet finish ranging from light to dark with mostly cool, gray undertones. I’m a big believer in the modern kitchen’s longevity. In contemporary homes in larger cities, designers and builders will be moving away from white and incorporating more cool wood tones to emulate what design styles that are most popular in current European kitchen design trends. Every year we see kitchen trends evolve from years past, always taking insight from European influences and what’s seen in last year’s magazines. Whether the kitchen that needs updating is reflective of a rustic modern farmhouse style or a contemporary kitchen with decorative metal accents, there’s always a new technique to how lighting, cabinet finishes and the furniture around the room can be approached for a great on-trend design for an up-to-date workspace. Christina Henck is an interior designer and founder of Henck Design. Based in Philadelphia, Henck is known for her "Classic Modern" aesthetic, which honors architectural styles and time periods while mixing old motifs with modern touches.